People impact each other to some degree or another but once in a while you meet someone that changes the course of your life. These paradigm shifters rarely realize what an effect they make on their world. Linda Runyon’s life shifted mine. Linda died on Sunday, March 12. Not much has been on my mind since and I don’t know how to do her memory justice with a simple blog but I will try to share a bit of the impact she had on me. Her work has become… my work. Her history fascinated me. Her adventures homesteading and living off the land captivated my imagination. Her keen observing eyes found beauty and usefulness in the smallest details of creation and brought her heart in tune with the Creator. 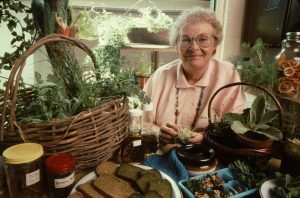 Her joy of nature and passion to teach others continued even when her body had to be cared for in a retirement center where she turned their manicured lawns into edible weed gardens and taught nature art to the other elderly residents. Her life had purpose, drive, and meaning till the end. 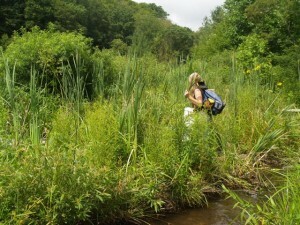 The last time I talked with her she was studying grasses and documenting their usefulness for food. I will miss her. She showed such love to me by lighting a wild fire under me and watching it burn and spread to others uncontrolled. She often told me that she was living out her dreams through me and was proud of my efforts to reconnect this generation to nature and nature’s God. I would call her after a wild food event or a talk I gave and she would hang on every detail and cheer me on. Several times I even called her during a class so my students could ask her questions. What a joy that was both ways. Even though I have only been with Linda twice in person, I have devoured all her wonderful books and have a complete Linda Runyon library. I have listened to all of her newsy podcasts on Eating Wild and we have exchanged literally hundreds of emails. I remember the first time I wrote to Linda, I was thrilled that she would respond and with such detail in answering my endless questions. I couldn’t believe she would give so much of her time and encouragement to someone like me but she did. Meeting Linda in person was such a thrill that I had to come home and write about it on my blog. 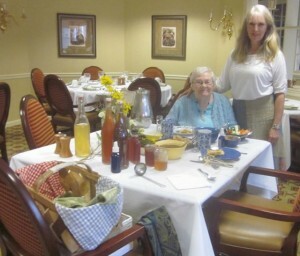 She even blessed me with a few of her homestead mementos which I now treasure. Along with the joy of Linda, I have had the privilege of working with her son Eric and Rosary to advance Linda’s work through several publications. 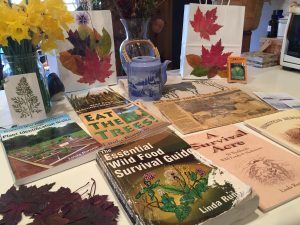 Here is another blog I wrote reviewing Linda’ fabulous book, Eat the Trees. So, in memory of this great woman, Eric and Rosary are planning to publish a book in her honor, and to post testimonials to her website OfTheField.com. They will be sending out a request via their website and email lists, so those who have been inspired by her words and work may contribute to it. So please be considering what you would like to share of how Linda Runyon inspired you, plus a few of your best foraging pictures, a favorite foraging story, and your best wild edible plant recipe. I would be happy to receive these submissions here at Wild Blessings if you want to send them along now, and I can forward them on to Rosary. This past year I have resumed Wild Blessings as a teacher after a hiatus a few years. Linda was thrilled. One of the last times we talked I was laying in the hammock watching Autumn leaves float down from the Hickories, Chestnut Oaks, Sugar Maples, and Birches that towered above me relating to her my latest teaching event. She hung on every word. As I hung on hers. I will miss you precious Mentor but you will live on through me and through so many who valued you and your work.